Full bellies and warm insides with this family favourite with a twist. 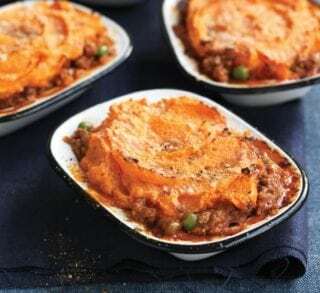 Take a look at this Shepard’s pie with Swede and Carrot Mash. 25mins prep and an hour to cook, get 4 of your 5-a-day with this dinner time hit! Heat the oven to 190°C/fan 170°C/gas 5. Heat a large non-stick pan set over a medium heat and spray with oil. Throw in the onion, garlic, bay leaf, thyme and celery and cook until soft, about 6–8 minutes. Add the mince and cook, breaking it up with a wooden spoon, for 5 minutes or until browned. Pour in the passata, beef stock, mustard and Worcestershire sauce. Bring to the boil, then reduce the heat and simmer for 25 minutes. While the pie filling is cooking, get a large saucepan of water, add the swede and carrots and bring to the boil. Reduce the heat and simmer for 20 minutes or until soft. Drain, then return to the pan and turn off the heat. Using a stick blender, blitz the vegetables into a purée, then season with black pepper. Stir the frozen peas into the filling, then spoon the mixture into 4 x 450ml pie dishes or 1 x 1.75–2-litre baking dish. Cover evenly with the swede and carrot topping, then scatter with the parmesan and spray with oil. Bake for 20 minutes or until the topping is golden. Remove from the oven and leave to cool and stand for 5 minutes before serving. And there you have it! a classic shepherds pie, ready in no time and enough for the whole family. If you’re going to give this a try, please share your results with us on our Facebook and Twitter pages.